After years of failed romantic relationships (including a divorce), Stacy is ready to admit that the common denominator in all these disasters is Stacy. Shortly after men get to know her they feel compelled to…move on, because after a while they find her to be just a bit much. She’s kind of like Las Vegas; if they stick around long enough all they want to do is leave. With both sides of Stacy’s psyche weighing in, she’s left to figure out what men want when it comes to strong, independent women who unintentionally do intimidating things like buy their own homes or finish the New York Times crossword puzzle in one sitting. 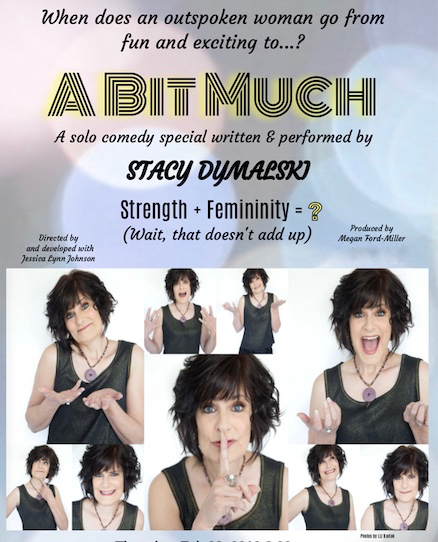 A BIT MUCH is a LOL funny, insightful journey that illustrates how women can comfortably step into their own brand of strength and femininity without compromise, while still attracting and maintaining the perfect relationship. Spoiler alert: its harder than it looks, but not impossible.